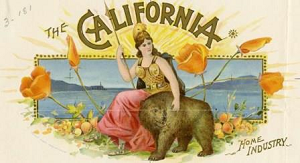 The Constitutional Convention of 1849 adopted a “Great Seal of the State of California.” Two main features of the seal are the seated figure of the Goddess Minerva and the California Grizzly Bear crouching at her feet. Other design elements include a gold miner, ships upon a mountain-rimmed bay, and the motto “Eureka,” which means “I have found it.” Many California trademark labels included likenesses of the Great Seal, which could have given consumers the impression that such products were officially approved by the state. Today, it is a misdemeanor to use any representation or facsimile of the Great Seal of the State of California for commercial purposes.